Perma C-K-Tone Filler is a cementations material in powder form. CTF only needs on site addition of water to make a mortar which is used for grouting tile joints. It is also used for grouting the joints between stones, marbles cut stones etc. Conventional type of grouting with white or colored cements make the joint rigid and it collects dust, dirt and stains. The cement having a high shrinkage property, it tends to crack and create leakage problems. CTF is modified to give high tensile strength, non shrink and waterproof properties. Further the product does not take stains and keeps the joints clean if cleaned properly with a detergent solution periodically. Perma C-K-Tone Filler is used for grouting tile joints. It is also used for grouting the joints between marble, granite tiles and joints of cut stones and terracotta tiles. 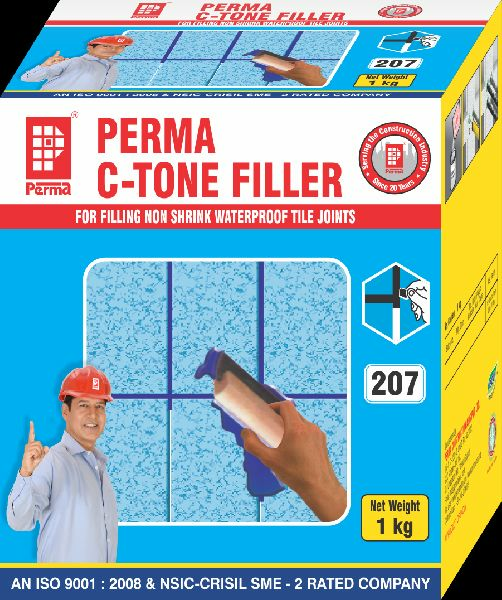 Perma C-K-Tone Filler is specially selected for grouting swimming pool tile joints because of its excellent waterproof properties. Packing : Perma C-K-Tone Filler is available in 500 gms and 1 kg corrugated printed cartons and in 10 kg multi-wall laminated sack.